A Fresh Take on Lever Hoists! Redefining lever-operated hoists, the CM Tornado 360º features the revolutionary Sidewinder lever handle that allows for efficient operation in both lifting and pulling applications. Ergonomically designed for increased safety, the patent-pending CM Tornado 360º lets the operator to work up to 12x faster and with as much as 30% less pull force than with conventional ratchet lever tools. Now available in 3/4 Ton - 9 Ton models. 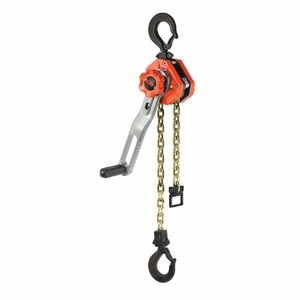 Just like the Hurricane 360º Chain Hoist, the Tornado's body rotates a full 360º to allow loads to be lifted, pulled, or positioned from virtually any angle. CM's lifetime warranty on all mechanical components, including the Sidewinder lever handle, is the industry's best warranty against manufacturing and material defects. And with their 3-year brake warranty, CMCO will replace the ratchet disc assembly free of charge if the brake discs wear out within 3 years from the date of purchase.